“The Devil Thought He Had Me- HA! But I Got Away,” from Christian Faith Publishing author Natalie Arnold is an anecdotal tale of staying clear of sin and vice and believing in personal strength to overcome adversity. “The Devil Thought He Had Me- HA! But I Got Away”: a powerful tale of overcoming adversity and finding faith from the life story of the author. “The Devil Thought He Had Me- HA! But I Got Away” is the creation of published author, Natalie Arnold, is a resident of Memphis Tennessee, mother of three children and two step children while being a wonderful grandmother of eleven. Published by Christian Faith Publishing, Natalie Arnold’s new book is a personal journey of a woman who must overcome the challenges to find fulfillment in God. Through this story Arnold hopes the same strength that helped the author overcome personal challenges. From birth, it seemed the universe was out to get Natalie Arnold. Born with illness and disability the young girl didn’t have an easy start to life, and it only got harder. This, and mounting family issues, could have have broken the girl, but instead of submitting to sin and vice, she learned to have faith in God’s plan. View a synopsis of “The Devil Thought He Had Me- HA! But I Got Away” on YouTube. Consumers can purchase “The Devil Thought He Had Me- HA! But I Got Away” at traditional brick & mortar bookstores, or online at Amazon.com, Apple iTunes store, Kobo or Barnes and Noble. For additional information or inquiries about “The Devil Thought He Had Me- HA! 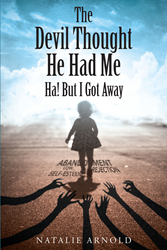 But I Got Away”, contact the Christian Faith Publishing media department at 866-554-0919.